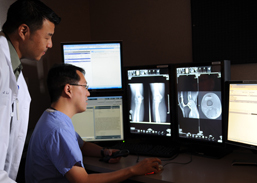 The U.S. Defense Department has furthered its investments in digital radiography and medical imaging systems after awarding a one-year, $70.2 million contract extension to imaging provider Carestream Health. The extension, which goes through Dec. 15, 2014, is part of a six-year contract that includes the U.S. Army, U.S. Navy, U.S. Air Force, U.S. Marine Corps and federal civilian agencies. The contract will come from fiscal year 2014 defense working capital funds, according to DoD officials. Medical imaging systems involved in this contract include Rochester, N.Y.-based Carestream’s digital radiography systems that deliver access to X-ray exams by radiologists and physicians. Federal agencies will utilize wireless detectors that can be used with new or existing room-based or mobile imaging systems. Officials say the imaging software can help improve visualization of soft tissue in the chest and also helps physicians verify correct placement of tubes and lines used in treating patients. The DoD is also actively working to modernize and integrate its electronic health records system with that of Veterans Affairs, a project which has seen considerable challenges early in 2012. "My focus really comes down to modernizing our systems and figuring out how to really get our data from the point where we're just sharing data to where it's actually helping make better decisions," said Christopher Miller, program executive officer for the DoD Healthcare Management System, at a November Armed Forces Communications and Electronics Association event. "We are not just one or two hospitals in a region…We are an integrated, global delivery network with more than 9.6 million beneficiaries in major medical centers, clinics and even ships," he added.